Celebrate Hanamatsuri, the Flower Festival and birth of the Buddha. 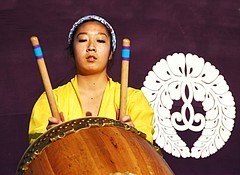 Discover Buddhist taiko drumming, with multiple performances both days as well as signups to try the taiko drum. Also floral altar, Japanese classical dancers, martial arts demo, children's games, talks on Buddhist practice, meditation with shakuhachi (Japanese bamboo flute), sumi-e brush painting exhibits, Japanese food, farmers market, garden booth and boutique with craft items.